Travel is all about discovering new cultures and places, making new friends and learning new things along the way. I got to do all of those things during a recent business trip to Port Saint John, New Brunswick, Canada where I had been invited to speak at their Port Days conference. Saint John (otherwise known as #SaintAwesome) Canada’s first incorporated city, is also the only city on the Bay of Fundy and home to the highest tides in the world. Located on Canada’s eastern seaboard, it is a standout stop for cruise visitors from around the world. There is an impressive list of shore excursion options available from this port including the #2 TripAdvisor adventure tour ‘Zip Line Over The Reversing Falls’ which, take note, are often referred to as rapids rather than falls. I guess it all depends on how you gauge your rapids and falls! 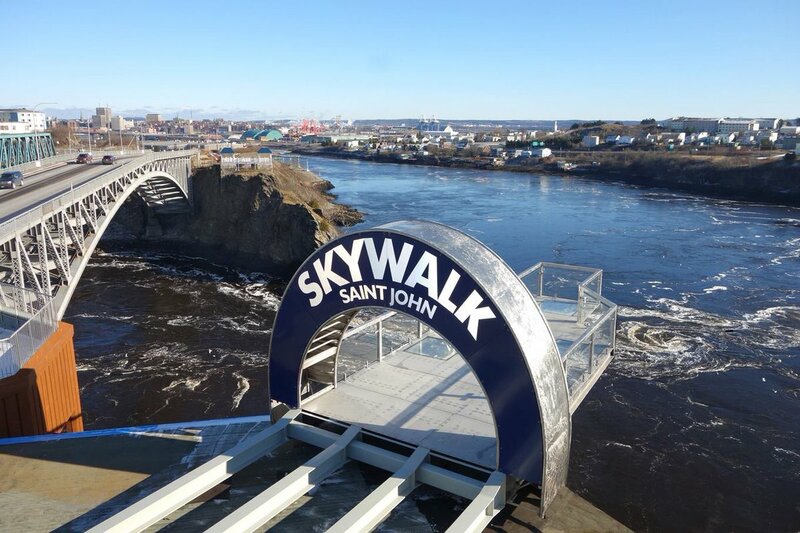 A new SkyWalk at the Falls will be opening for business sometime late June, early July 2017 – it seems to be gaining a lot of attention, so look out for that one. 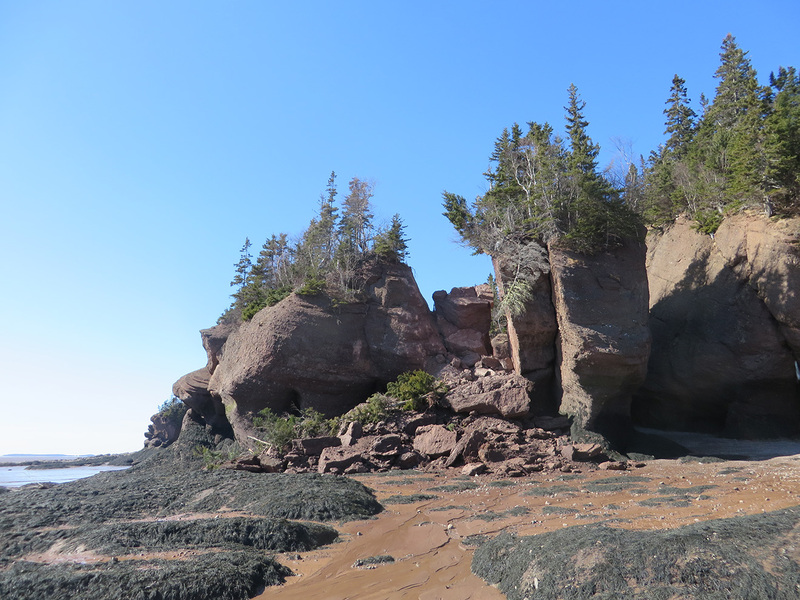 Another tour that took my eye is the highly acclaimed and family friendly ‘Hopewell Rocks Tidal Discovery Tour’ where, thanks to the 50 ft rise and fall of the tides plus an informative local Ranger, passengers walk on the ocean floor exploring and uncovering all sorts of fascinating facts and things along the way. This tour comes highly recommended but be aware that there is a 2-hour transfer to the site. Don’t let that put you off though, Saint John is renowned for their fantastic tour guides, and the on-line reviews that I came across were very complimentary! I do believe that this tour sells out quickly so I would suggest booking online well in advance to avoid disappointment. Unfortunately, my time in Saint John was limited but none the less I did manage a bit of an explore around the very trendy ‘UpTown Saint John’ area located within an easy walking distance from the port. Plenty of great bars, microbreweries and artisan shops to explore. This area is gaining popularity, and I loved the whole boho, trendy feel of the place. I was very tempted by a beautiful handmade silver dragonfly necklace but decided instead on half a dozen handmade ‘extra strength’ wooden clothes pegs. I have no idea why, and as I write this I find myself wondering how I came to make that rather shortsighted decision. Best just blame it on the inner Domestic Goddess who was behaving in a rather boring and practical manner on this occasion. The only tour that I took part in during my time in #SaintAwesome was a tour of the Moosehead Brewery, and if you like beer then you’re going to love this! I’ve done a couple of brewery tours on my travels in the past and have always found them to be fun – especially if you happened to have visited the port before and are looking to do something a little different ashore. However, I was quite fascinated by this one as it also included a food pairing. I don’t want to spoil the surprise, but really? Chocolate dipped strawberries with BEER?! Now don’t be so quick to judge peeps, as this totally worked. Canadians know (and love) their beer and this tour certainly hit the spot when it came to gaining an insight into what makes their beers taste so great. You also get to taste a variety of brews along the way (hic) and… you also to keep your tasting glass as a souvenir. Best check to make sure the tour your cruise line is offering does include a food pairing as I believe there are different versions to be had. That said, even without the food pairing, the tour is fun with lots to see, learn and taste. I particularly loved the tale of the Moosehead heist. Gotta love a good story featuring a bandit and a truckload of beer that was last seen heading to Mexico! Google it; you won’t be disappointed. Unfortunately, this tour is not one for those with mobility challenges as there are several steps and staircases to negotiate. It’s also rather noisy. Not that that bothered our group, but I do feel I should mention it. As an FYI, protective eyewear and ear buds were provided. I often find that on tours where alcohol is served the return bus transfer can be quite raucous and fun as a few bevvies always seem to help loosen tongues and inhibitions. In fact, our return journey onboard our bright red double decker bus had quite the whiff of Cliff Richard’s ‘Summer Holiday’ about it. So upbeat and relaxed were we, the happy travellers, as we made our way back to port. Not quite singing, but certainly a little louder and a little more content than when we left a mere three hours earlier! Many thanks to Port Saint John and all involved for your wonderful hospitality.